J.R. Maddison, an Englishman, started his tattoo career in 1934 with the help of his grandfather, who was said to have tattooed 40 years. Maddison was known for carrying his hand tools in his waistcoat and tattooing the lads around the back of the dance halls. In later years he worked out of a caravan, not unlike a small Airstream trailer. Maddison said that he was so busy tattooing that at night he had to remove the sign from the front of their trailer so that he and his faithful wife Lily could get some sleep! 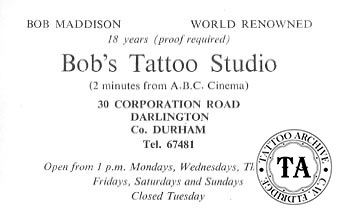 For 15 years Bob Maddison worked at this fair while also tattooing at his home in Quebec, County Durham, England. In the mid 1950s he moved to Darlington, County Durham, where he worked until his retirement in 1979 due to ill health. 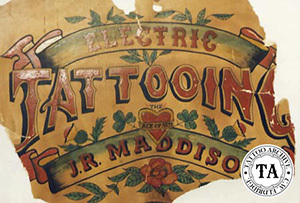 Bob Maddison's tattooing was from the era of the grand old school, bold outline, solid color and American-European-Japanese style images. Throughout the years he must have tattooed a lot of military personnel. However, in a 1970s interview he said that he did not tattoo military badges or insignia stating that, "In the last war when I joined the territorial and war broke out you were stripped clean of all badges. You just went to war with your number, rank, and religion, on a necklace and a bracelet. Those that had regimental badges tattooed on them were running here there and everywhere to get them covered or removed". 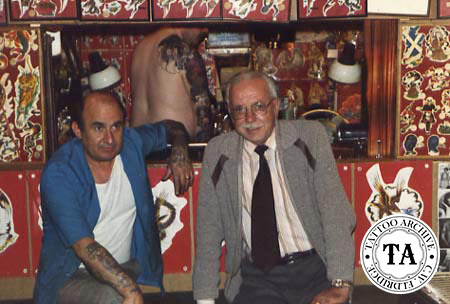 Terry Wrigley said in a letter, "When most British tattooers used a single needle Bob did excellent work. I dare say that apart from Rich Mingins there was no one to beat him. Then in the early sixties he changed over to thicker outlines and his work suffered".